Walter Flanders was one third of the automobile company E-M-F (along with Bernard Everitt and William Metzger). Studebaker acquired E-M-F in 1910 (and phased it out in 1913). So Flanders set up shop producing a car under his name. This too was part of Studebaker and it was gone after 1912. Interestingly enough, Flanders started another company after this one. It lasted only a brief time because Flanders himself went to help Benjamin Briscoe and his United States Motor Company. Walter Flanders started killing off weak brands (including Flanders). Only Maxwell survived that fiasco. This is a 1912 Model 20 (the final year for the model and marque). It is powered by a 20 horsepower straight-four. The Touring model cost $800 when new and 31,512 Model 20 cars were built over three years. This one presents nicely and should bring between $20,000-$30,000. Click here for more info and here for more from this sale. 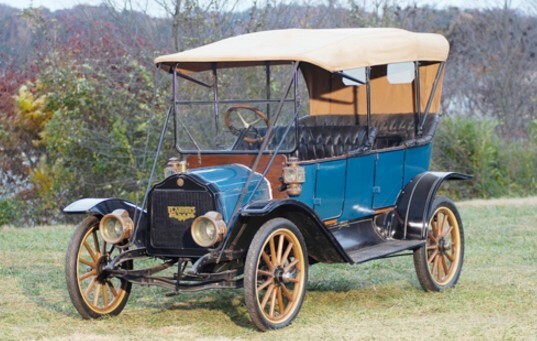 This entry was posted in Uncategorized and tagged 1912, auctions, auctions america, cars, classic cars, flanders, model 20, touring by classiccarweekly. Bookmark the permalink.